MOSCOW, November 11 (Itar-Tass) — Russia’s Emergency Situations Ministry (EMERCOM) will deliver humanitarian aid to New York City that has been affected by Hurricane Sandy. The EMERCOM information department told Itar-Tass that it is planned to deliver more than 50 tonnes of humanitarian supplies to the residents of New York City. “On Monday, November 12, two Ilyushin IL-76 planes of the EMERCOM are to take off from the Ramenskoye airfield outside Moscow in order to deliver to New York more than 50 tonnes of humanitarian cargoes,” a ministry official said. Hurricane Sandy hit the East Coast of the United States on October 29 and has killed more than a hundred people. Russian Emergency Situations Minister Vladimir Puchkov ordered in late October to consider issues of emergency humanitarian response to assist countries affected by Hurricane Sandy. 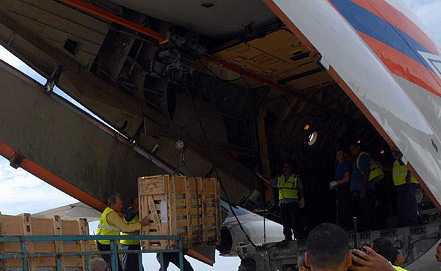 The Russian Emergency Situations Ministry has already provided humanitarian aid to Cuba, sending a few planes with humanitarian aid in response to the request of the Cuban side. Seven years ago, in September 2005, the Russian Emergency Situations Ministry helped the United States in the aftermath of Hurricane Katrina. Then, three EMERCOM planes delivered to the United States more than 60 tonnes of humanitarian aid, including medical supplies, rations, tents and blankets.